For the last year, Marketplace has been following a grand experiment in education as it unfolds at Oyler School in Lower Price Hill, a lower-income neighborhood in Cincinnati. The effort hinges on a central question: can a school transform a community battered by poverty and crime by creating a culture of high school graduates almost from scratch? Oyler is part of a growing community school movement built on the idea that the best way to lift kids out of poverty is to give them the services and support they need to succeed in school. Our series takes us into Oyler's world as a community learning center, which offers health and mental health care, vision and dental services, early childhood and adult education, food and mentoring. We get to know its students as they struggle to become the first in their families to graduate from high school, and the dedicated teachers and staff who are trying to get them there. We're there for the first day of school, and at Christmas and prom. We see the setbacks, the violence and the crime that threaten to erode the progress Oyler has made. We follow one promising student as she visits an out-of-state college that could be her ticket to a better life. We watch as more than 40 seniors cross the stage to receive their diplomas. We also get to know Lower Price Hill, the struggling Urban Appalachian community that Oyler is trying to change, by changing the future of its youngsters. 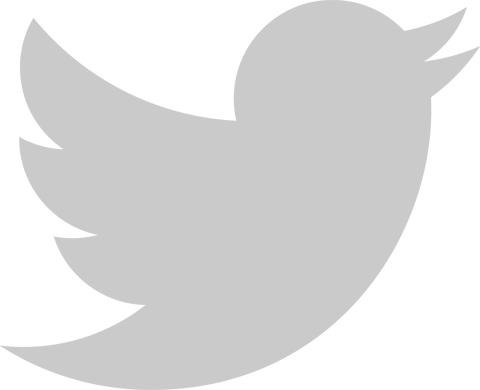 To understand Oyler, it helps to understand its history. The school is in Lower Price Hill, on Cincinnati's west side. When coal mining jobs in the Appalachian region dried up after World War II, people came to Cincinnati, looking for factory work. Many of them settled in Lower Price Hill, a small neighborhood of brick row houses on the banks of the Ohio River. Over time, most of the factories closed, and what had been a close-knit community has frayed from the effects of poverty  drug addiction, prostitution and a lack of education. Without a high school in the neighborhood, most kids eventually dropped out. Then, in the late 1990s, a state Supreme Court ruling led to an influx of funding to rebuild Cincinnati's schools. Facing declining enrollment and growing poverty, the city decided to turn all of its public schools into full-service community learning centers. 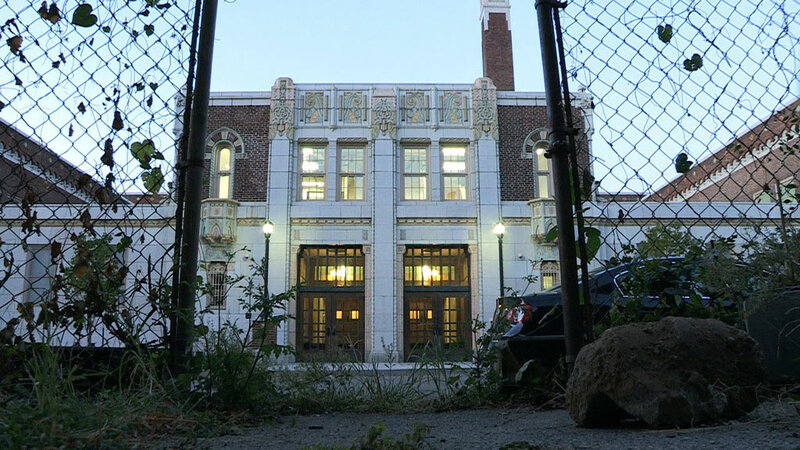 When it came time to rebuild Oyler, Lower Price Hill demanded a high school. So in 2006 the high school opened along with a health clinic and after-school programs. By 2010, school leaders say, more kids from the neighborhood had graduated than in the previous 85 years combined. In 2012, after two years in a temporary space, the newly renovated Oyler opened for business. Leading the charge at Oyler School is Craig Hockenberry, now in his 12th year as Oyler's tireless principal and chief booster. We also meet Jami Luggen, a former bank manager who coordinates the dozens of community partners working in the school. There's Joe Saylor, who grew up in Lower Price Hill, and came back as a teacher and coach; and there are the students, like Raven Gribbins, who aims to be the first in her family to graduate from high school and go to college. The stories take us from the first day back in the old neighborhood after Oyler's renovation, through the opening of a brand new vision clinic in the school. We're there for Christmas, as Oyler and its partners pull out all the stops to give poor children a happy holiday, and as the school devotes an entire day to getting kids as young as preschool thinking and talking about college. We're there as the school faces the possibility that its beloved principal might be out of a job, and as senior Raven Gribbins gets a taste of college life away from home. Educators around the country are watching Oyler, too. Could it be a model for other high-poverty schools? Community school initiatives are cropping up around the country, from Portland, Oregon to Tulsa, Oklahoma. Throughout the year, Oyler hosts group after group of visitors eager to learn something from its success. What would it take for this to work on a larger scale? Oyler students have grown up surrounded by crime, drugs, and violence. Their parents work low-wage jobs or rely on welfare. Education may be their only way out. But they need help. One School, One Year takes us behind the scenes as Oyler’s students try to break the hold of history, graduate from high school, go on to college, and get a shot at a better way of life. Fourth-grader Charles Marsh gets a checkup at Oyler School's health clinic. Nurse practitioner Dilruba Rahman treats students at school and bills their insurance or Medicaid. 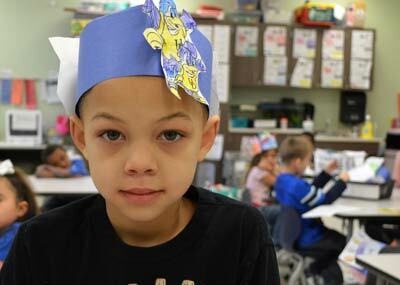 First grader Mark Tobin wears a University of Delaware crown. Each year Cincinnati's Oyler School devotes a day to getting kids from preschool through 12th grade talking about college. Photography and Video by Amy Scott, Malinda Hartong, Glenn Hartong and Stacy Doose.